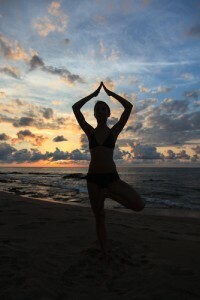 Yoga is a very popular activity and it is growing in popularity every day.We have a 12 acre yoga center listed for sale with out of this world amenities and views. Dominical is a place where the mountains literally meet the sea, and on this property, the river meets the ocean. A leading surf and yoga retreat in the country, Danyasa has provided a way for many tourists and locales to relax, heal, and enjoy an atmosphere of immense personal development. This property is titled, riverfront and has over 70 feet of frontage on the Main Street area of Dominical Centro. Featuring a retail boutique on site at ground level and an open air, hardwood floor yoga studio on the upper level, there is so much potential in this yoga retreat for sale in Dominical. This Costa Rica commercial real estate comes with not only this gorgeous property, but a well established and profitable business and is a well known teacher training program for yogis with aspirations of teaching. You can even paddle board directly from the rear of the property. This is one of the southern zones best business opportunities. Click to see more photos and find out more. Priced under $500,000 this property is an amazing property that you could invest in and immediately see a return.